"The pages of this little book deal almost wholly with just one phase of prayer - petition. The record is almost entirely a personal testimony of what petition to my Heavenly Father has meant in meeting the every day crises of my life." I think that the fact that this book is a personal testimony and not scriptural instruction on prayer is an important clarification to make right from the get-go. If you are expecting a book that teaches more about what the Bible says concerning prayer then you will most definitely want to look elsewhere. If you like hearing personal testimonies, then this might just be the book for you. I do have to say that my church background made this something of a difficult book to read and enjoy, personally speaking. As her personal experiences influences her thoughts and words, so mine also have a marked effect on me. This is not something that anyone can avoid but, rather, expected. I appreciate that Goforth wants to share her stories but at the same time I can't wholly appreciate the manner in which she communicates her story. I'll try to explain why below. First I should tell you that I struggle with missionary stories. Why is that, you ask? Aren't missionary stories beneficial to hear? Yes, I think so. However, I've seldom been exposed to missionary stories without an attempt being made to guilt me into becoming a missionary myself. Yes, yes, I am familiar with the verse which says we are to go out into all of the world and make disciples of all nations. I fully concur (because it would be stupid of me not to) but I don't think that missionary work can only take place 10,000 miles from your original home. Nor do I think that this issue of sharing one's faith needs to be such a cerebral argument. If you live your life fully alive to Christ right where you are, people will notice. It is inevitable. (Unfortunately, this is inevitable.) You are constantly living out a testimony before your household and your immediate neighborhood. I do have one additional issue with missionary stories and that is that sometimes missionary stories are so fantastical that they depress ye olde average Christian. Amazing things seem to happen to missionaries that never seem to happen to me. Now, this is not a problem. I do not mind this or begrudge them their experiences. However, I tense up when a see/hear of a Christian reading a missionary story and taking it upon themselves to revolutionize their own prayer life and "common existence" in order to prove that they are also the Lord's and are doing the Lord's work. In a way, I almost urge caution in reading missionary stories. You may or may not be called to a foreign mission field but if you aren't, you shouldn't feel bad about this. Live fully for the Lord right where you are. That might just be God's good plan for you. The stories which Goforth relates to testify to the fact that God answers prayers are sometimes fantastical and oftentimes general notes of met needs. Obviously, God can do as he likes and if He wants to answer certain prayers in jaw dropping fashion He is welcome to do so and you won't find me trying to stop him. Yet at the same time, I'm still cautious about spending too much time focused on fantastical experiences. Why? Please let me explain. "Lord Jesus, if you will take away this toothache right now, now, I will be your little girl for three years." Before the prayer was well uttered the pain was entirely gone. I believed that Jesus had taken it away; and the result was that for years, when tempted to be naughty, I was afraid to do what I knew was wrong lest, if I broke my side of what I felt to be a compact, the toothache would return. This little incident had a real influence over my early life, gave me a constant sense of the reality of a divine presence, and so helped to prepare me for the public confession of Christ as my Saviour a few years later, at the age of eleven." Now, I am not discounting the fact that the Lord took away her toothache at all. But I would quickly point out to believers that God sometimes chooses to heal us and sometimes doesn't. Either which way, He doesn't require that we make deals with Him to bring healing about the thing we want, and we ought not to try and bargain. Jesus completed the bargaining process when He died on the cross in order to forgive us all of our sins and conquer sin and its effects - once and for all. There is no need to wheel and deal with God. I'm afraid that people reading this part of Goforth's testimony will think that bartering life experiences with God is a good and holy thing to do. She has the wrong idea here about who God is and who she is which I find regrettable. "I told them plainly that I could not say that it was indeed the Lord's will to heal the boy; all that was clear to me was that we must obey as far as we had light, and leave the rest in God's hands for life or death." I agree with her follow-up remarks. We must obey God and pray to Him but also leave the results in His hands, knowing that whatever He has ordained is right. Our job is simply to believe in Him. This does not mean sorrow will never cross our paths. On the contrary, sorrow will become friends with us at some point or another. But again, this does not change our standing in Christ. To say it a little differently: Trust and obey. There is no other way. An additional point of interest to me, as relates to Goforth's theology, was in her telling the story of a man in China by the name of Mr. Wang. Mr. Wang was a proud and overbearing sort until he confessed his position as a sinner and Christ's position as Savior. The manner which God used to bring about repentance is one that is rather foreign to us in these modern times: God used a dream. Goforth writes that it was not uncommon for people's consciences to be awakened to the truth through dreams. "This man, later on, became Mr. Goforth's most valued evangelist. For many years his splendid gifts were used to the glory of his Master in the work among the scholar class in the Changtefu district. He has long since passed to his reward, dying as he had lived, trusting only in the merit of Jesus Christ for salvation." Here is where I differ from the more conservative among us. Many say that God no longer communicates with people in dreams. I actually don't agree with that. I believe that God's power and abilities are not limited by what I think He can do or not do at any point in history. I think it would be prideful and misguided to places limits on His powers, saying that He no longer speaks in dreams and visions in these modern times. (Also, I would say that He could raise the dead today if He wanted to. It would surely be miraculous and could totally happen. But we don't see it happening these days. That's neither here nor there for me. My main point is that if He wants to, He can.) I fully believe that God has spoken to me in dreams. During the time period in which we were attending the aforementioned Charismatic church, I dreamed a few dreams that were deeply encouraging and spiritually uplifting to me. No, they did not foretell the future. They were not visions of things unseen. Rather, they simply encouraged and blessed me, giving me courage to face challenges that were then in my life. I have also been convicted in dreams before. In summary of this point, I do not discount God's ability to use dreams and I find stories about God using dreams in this modern age rather fascinating. "One evening my husband returned from an evening meeting, which I had not attended, and told me of a woman who had come to him in great distress. She had been an earnest Christian worker, but love for light, trashy fiction had so grown upon her as to work havoc in her Christian life. She had come to Keswick three years in succession, hoping to get victory, but had failed. My whole soul went out to the poor woman; I longed to help her." Three evenings later Mrs. Goforth did happen to meet this woman, but did not immediately recognize her. ". . . I noticed [this woman] was in great distress, her tears spilling fast. I laid my hand on hers, and she grasped it convulsively. At the close of the meeting I said, "Can I help you?" "Oh, no," she replied, "there is no hope for me; it is those cursed novels that have been my ruin." Scarcely able to speak for emotion, I told her, and also of my prayer. For the next few moments we could only weep together. Then the Lord used me to lead the poor crushed and broken soul back to Himself. As we parted, a few days later, her face was beaming with the joy of the Lord." I snicker again. It would be helpful if Mrs. Goforth had provided some examples of what kind of "light, trashy" fiction this poor, dear woman was reading. Was it Dickens? Austen? We can have no idea. It is true that some Christians believe that you ought not to read anything but the Bible. There are others who put strict limits on what types of fiction that they will allow themselves to read. I disagree with the former sorts completely, but have sympathy for the later. You do need to choose your reading materials wisely and well because what you read will have great influence over your thought processes and therefore your life! But do read. 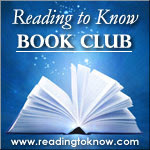 And I hope you will read without feeling massive guilt for having enjoyed the read. Now that I've spent the majority of this post blasting the book, let me share two things which stood out to me as being very encouraging. "It is true that 'There is nothing too great for God's power'; and it is just as true that 'There is nothing too small for His love!'" True! This is a good reminder. So often we're tempted to think that we can't approach God with things we deem Him to find insignificant. I believe He wants us to communicate our cares and concerns in every situation with Him. If we are honest about our feelings of frustration when waiting in a line to fill up our cars with gas, He can work with that just as well as if we are mourning the death of a loved one. Honest emotions presented to the Lord over any matter are good and useful. In the hands of the Redeemer, absolutely not one little moment is wasted. Not a single one. The biggest encouragement for me in this book came out of mixed statements that were made by both Mr. and Mrs. Goforth. Mrs. Goforth occasionally feared for her children's health and safety and wanted to keep them out of harm's way, even if that meant she would refrain from doing missionary work herself for a time. Mr. Goforth would (kindly, I think) argue that if she did not obey the Lord in her calling, then he "feared for the children" (meaning if they did not obey the Lord, he fully expected harm would come to their offspring). "The safest place . . . is the path of duty." This is good for me to hear for I am inclined towards worry. The flu. Ebola. ISIS. Badly canned green beans. Thieves that break in at night and steal. Death. Bridges collapsing while my car is driving over them. You name it and I've probably worried about it. The past few days I've been reflecting on the idea that the safest place is in the path of duty. To rephrase that, the safest place is in being obedient to God and that includes "simply" obeying His commands not to worry because it doesn't actually add any additional years of life to my person or any cubits to my stature (in the right direction, I mean). "Ironically," the times in which I have been obedient to what He was asking of me - even though I personally deemed the situations "unsafe" - turned out to truly be the safest thing. Much reward comes from obedience. Much regret follows disobedience. Allow me to also quickly say though that I do not believe that God is sitting around with an intent to harm me or my kids if I do not obey. Certainly there are always consequences for both action and inaction and plenty of scriptural passages which indicate that you will be most blessed when you choose obedience. However, I do not believe that I will be thrown from His hand if I choose disobedience. I'm back to where I started up above - my job isn't to sit around bartering with God. These are required of me as I set about pursuing His will for my life: belief, trust, and obedience. And so I will conclude my very long thought processes on this book. I have been sitting on this post for a good week, editing and re-editing, trying to close up loop holes and address silent arguments. This post reflects my best effort to communicate my beliefs, knowing that there are still likely gaps which are not obvious to me. I welcome comments and discussion, so long as it is polite in tone. To answer the question of whether or not I am glad I read this book well, yes, I am always glad to have finished a book. I especially like short ones which prompt so much internal debate, which this one did. Perhaps I cannot say that I loved it at face value, but I do appreciate the issues it brought up for me to grapple with. I agree with much of what you say, though I've only scratched the surface of the book thus far. I mainly wanted to say thank you for sharing what you did about the safest place bring in the path of duty. I have something to do in my path of duty that has made me a little bit fearful, so this is an encouragement to me. I do agree that one doesn't have to minister 1,000 miles from home to be in the center of God's will, and that whatever we do is a testimony. I have been reading missionary biographies for something like 37 years and I can't recall any that I have felt tried to guilt the reader into being a missionary. I've read biographies of doctors, pilots,businessmen, sports stars, as well as missionaries, not because I feel called to any of those professions, but because I wanted to see what makes them tick and to learn something from them. Wherever God had placed us, whatever we are called to do, that is His highest calling for us. I think most missionaries would not want us to think of them as more special or closer to God or further in His will or better servants of His or any of those things. I have come across some older biographies written years after the missionary had died that were written in such glowing terms that I think the missionary in question would blush to know about. Most missionaries I have ever read about or known personally very much wanted people to know they were very human and not "special." I don't recall that much fantastical about the answers to prayer recorded in the book. In fact, the ones that stood out to me were the "ordinary" ones - help with getting children's clothes, finding a lost key, strength for a task, etc. I don't think she was trying to set the stories up as "Look at me and my wonderful answers to prayer," but rather, as the psalmists did (I've just finished reading through the Psalms), "Come see what the Lord has done." Plus I think she wanted to encourage people to ask and trust Him for themselves. In the prayer you mentioned where she was "bargaining" with God that she would be a good girl for 3 years if He took her toothache away - she was a little girl when she prayed that. I think we have all prayed such prayers either in childhood or in our early walk with God before we realized it doesn't work quite like that. She doesn't advocate praying that way in the rest of the book, that I recall. I just assumed people would see that as a childish incident that the Father deigned to answer in His grace, despite her "bargain," but it probably would have been better if she had spelled it out. I hardly think Mrs. Goforth would have categorized Dickens and Austen as light, trashy fiction. :-) Whatever the woman had been reading, it was enough to trouble her. (When I think "trashy," I think Harlequin bodice-rippers, and yes, I can see someone feeling convicted about those). You're right, this is a book of testimonies and not a Bible study, but she does include a list of Scriptures in the back on "Conditions of Prevailing Prayer" and "Causes of Failure in Prayer." I'm sorry there was so much you didn't like about the book. I just finished it this morning and will probably have a review up in a day or two. I have a missionary story to read this month that I'm pretty excited about. I hope it doesn't turn into a "you should leave your home and be a missionary" kind of story, but I kind of don't think it will since it's about a doctor and a specific ministry. As for answering prayer, does she ever talk about prayers that weren't answered? Or prayers that were answered in a way that she completely was not expecting? I also don't agree with bargaining with God and I like how you put it, but I might point out that she says she did it before she was a Christian. And that experience led her later to fully trust and become one. Missionaries are needed right in your own community. Being a missionary doesn't mean you have to travel away. But work for the Lord, as you said, in your home. I am reading a book right now on prayer and it is driving me crazy. Such silly arguements about why or why not. That I felt just listening to someones testimony of answered prayer was very refreshing. What convicts on person does not convict all... "work out your own salvation with fear and trembling". So because a book convicts her doesn't mean it will convict someone else. I'm laughing (with you) at feeling guilty when you read missionary stories. I'm guessing most of us feel that way. I do too. In my case, it's more of a reflection on internal guilt than the author pressing it on me. I agree that Mrs. Goforth did not make me feel guilty through her words. And I also agree with you 100% that we are called to do be light wherever we are, and for most of us (by default, the majority of us) it is in our circle of "home." I finished reading the book this week but haven't written a review yet. Maybe I should just say "see Carrie's" since you are so thorough here. :) I'm very grateful I read the book; it solidified some things for me and raised questions for me too. Signs of a good book! @Barbara - I am not sorry to have read it though! And as I tried to say at the beginning, I am basing a lot of my dislike off of personal experience (which is what she is basing her book on - her own experiences). I can't help but read Christian books through the eyes of how I think others might view them, and not just myself. I can also totally see that a missionary story would be an encouragement. I think of Corrie Ten Boom (who some might not call a missionary but she has a very loud testimony to others) and I am inspired and encouraged. Then I think of Elizabeth Eliot and I'm put off somehow. I also really don't think I would get along very well with Amy Carmichael. But Joni E. Tada? Love her. I think personality has a lot to do with it - and also whether a book is a biography or an autobiography. As you say, many missionaries might blush to think of how they have been portrayed to others. That is definitely something to take into consideration. Re: her praying this prayer before she was a Christian . . . I can't agree exactly there. I am pro-covenant theology and I wouldn't say she made the prayer before she was a Christian but THAT is another long post altogether. :D I think if she HAD spelled out that the prayer was misguided and theologically incorrect then I wouldn't have fussed about it at all. And, as pointed out, she does tell a story towards the end of a book of a time when she understood God might not answer a prayer the way we ask Him to. So she balances out there. I really enjoyed your review! I haven't seen this book yet but I am soooo with you on what you've shared about being a missionary here in our own surroundings. it is VITAL to me that I raise my daughters( ages 21 and 15) to know that we are walking testimonies for Jesus and that we need to live well and represent Him well. we don't need to travel overseas to do that, in fact I believe God wants us to be missionAries wherever we go .....and I also appreciated your comments about your experience with a charismatic church. my husband and I felt that way about the church we were in for quite a number of years before the Lord moved us out from there to our current one where is a much healthier balance...more evangelical. I probably won't read this book. my fave missionary books over the years were The Cross and the Switchblade, and Bruchko. now HE was awesome. I appreciate your acknowledgement of how your "back story" has played into your reading and interpretation of this book. While I haven't finished the book yet, my life events have definitely affected how I am reading. I didn't start reading until we were on our flight to Washington DC, at which point I was already fearing the worst for our pregnancy. Mrs. Goforth's (isn't that the best name ever for a missionary?) testimonies of answered prayer reminded me again and again that my worrying and frantic efforts were not the answer to the threat of preeclampsia: God is the answer. And while Mrs. Goforth's testimonies were largely of prayers answered the way she wanted them to be, there were definitely glimpses of prayers that weren't answered as she wished. Altogether, my reading thus far has reminded me that God is sovereign and good and that He delights to hear the petitions of His children. One part in particular, struck me - as Mrs. Goforth was discussing the Boxer Rebellion (from which her family was saved but many others were not), she wrote: "Then too, after all is said, we must believe God was glorified and God's purposes were fulfilled in the death of some as in the saved lives of others." Reading that was hard (while the chances of baby and I surviving at this point are quite high - >95%) - but was so good to have the continued reminder of God's good sovereignty regardless of whether He answers yes or no to our specific requests. A most inspiring book! 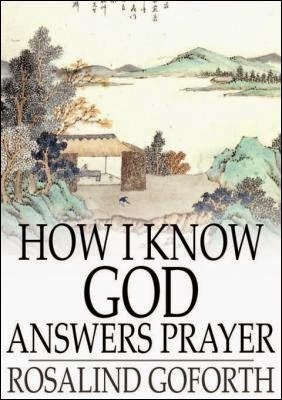 I gave it away and after reading about the work of the Goforth's in China, and Jonathan Goforth's book "Not By Might and Not By Power But By My Spirit Sayeth The Lord" I want to reread Rosalund Goforth's book "How I Know God Answers Prayer"!